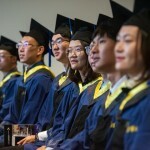 This past weekend, the University of Washington and Tsinghua University marked a significant milestone as the very first cohort of Global Innovation Exchange students received their degrees. I was proud and honored to congratulate these 37 path-breakers as they picked up their diplomas. Here at the University of Washington, International Education Week is an occasion to reflect on how important and valuable international education is to our students’ success and our impact as a global research university. From opportunities for our U.S. students to study abroad to welcoming students, scholars, faculty and partners from all over the world, international education benefits all of us. Yesterday marked the official opening of the new Global Innovation Exchange (GIX) facility – the newly-christened Steve Ballmer Building – in Bellevue’s Spring District. The celebration was a momentous occasion, fitting for the scale of impact I believe that GIX will have in uniting universities, civic leaders, government officials, industry partners, artists and entrepreneurs around global challenges. With the launch of this building, GIX welcomes the students, faculty and industry experts from around the world whose work and education will serve to benefit our region, and the world. Today I had the opportunity to once again meet with our Global Innovation Exchange partners during a visit to Tsinghua University. It’s a lush, beautiful campus, made even more vibrant by the fact that it was graduation season. There were countless graduates in caps and gowns all over the campus, posing for photos as they prepared to launch off into the world. It reminded me of our own commencement ceremonies just a couple weeks ago, and like then, I was inspired by the graduates’ optimism and how they have so much ahead of them. Universities play a vital – and unique – role in the innovation ecosystem. Leading the University of Washington, I see every day the ways in which the environment and community of a university are not only conducive to creation and discovery, more often than not, they are the drivers of innovation. Universities both augment the innovation in companies and institutions around them and they compensate for the fact that some organizations are not as well-equipped to do so.